The gospels tell us that Joseph of Arimathea took the body of Jesus and placed it in a tomb. Why? To show that Pontius Pilate, an independent witness, knew that Jesus was truly dead, and that the Galilean women could verify the location of the tomb. Why is this part of Jesus’ story important? It proves that Jesus had really died, and that he was buried by not one but two influential, respected men who could testify to the fact – an important point when you remember that the first Christians were accused of concocting the story of the Resurrection. Here was certain evidence, from reputable witnesses, that Jesus really died. The fact of his death could also be verified by the Galilean women who prepared Jesus’ body for burial; they were well-known and trusted by the Galilean disciples. Who were the men who buried Jesus? Joseph, probably born in a city in Judea call Ramathaim; he was a rich, influential man, a member of the Sanhedrin. He is described as ‘looking for the Kingdom of God’, and perhaps believed he had found it in Jesus. He may have been absent from the hastily-summoned council that condemned Jesus, or his objection to the sentence of death may have been over-ridden. Or he may even have lacked the courage to speak up in Jesus’ defence – Mark’s gospel says Joseph had to ‘gather up his courage’ to ask for Jesus’ body. It was risky for him to defend or protect Jesus; it could have serious consequences for advancement in his social, religious and political life. Nicodemus brought spices for the burial, powdered myrrh and aloes, about 70lbs in modern weight, a phenomenal amount. There is no explanation as to why he gave so much. But John tells us Nicodemus came to hear Jesus under cover of darkness, as if he were afraid; perhaps he was now trying to make up for this fearfulness. Here were two highly placed men of authentic Jewish faith who were able to respond to Jesus’ teaching. 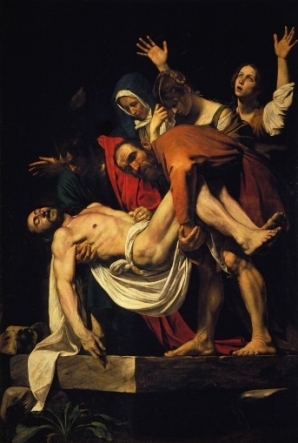 The task of burying Jesus, in the two-three hours of daylight remaining before the beginning of the Sabbath, could not have been carried out by just two men. Jesus’ dead body would not have been easy to carry, and the stone at the entrance of the tomb required several men to move it. Joseph and Nicodemus were both rich men who would have had a number of servants at their disposal. The choice of these men is a subtle criticism of the Galilean disciples. They openly followed Jesus and loudly proclaimed their loyalty, but when it came to the crunch they deserted him. Instead, two secret disciples who had nothing to gain and everything to lose stepped forward and arranged the burial. Why was Pilate surprised when he was asked about Jesus’ body? He had not expected Jesus to die so quickly. 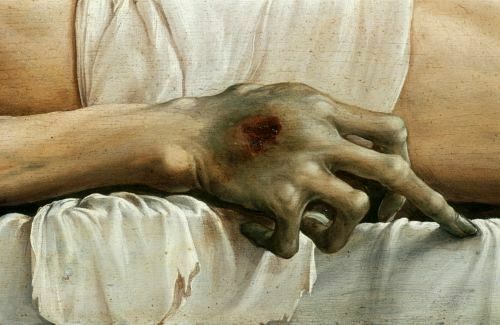 Victims of crucifixion usually lasted several cruel days before they died. But Jesus had suffered a terrible beating, no doubt causing critical internal injuries; and he had been nailed, rather than tied, to the cross, suffering debilitating blood loss. The Centurion, woodcut by Cyril Edward Power, c1929To make sure of the facts, Pilate questioned the centurion who had been in charge of executing Jesus, and was reassured that Jesus was indeed dead. He then released the corpse for burial. What did the chief priests and Pharisees fear? or that Jesus’ friends might steal his body and later claim that he was risen from the dead, as he had predicted. Either option would make it possible for Jesus or his disciples to claim that Jesus had made good on his promise to rise again after three days. Pilate had to be sure this would not happen. What actually happened when they buried Jesus? John’s gospel (see below) says that Jesus was buried according to the Jewish tradition. 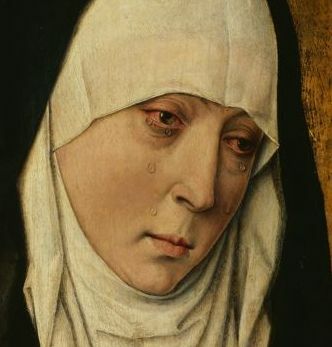 This means that the body was washed before it was wrapped in a simple shroud made of fine linen, normally a task performed by the women relatives of the deceased. There were prescribed psalms and prayers said at this time. The body was then placed on a stone shelf within the tomb. Jesus’ burial was quickly done. Everything had to be finished in the sort period remaining before sundown – all the people involved were strict Jews, carefully observant of the Sabbath. 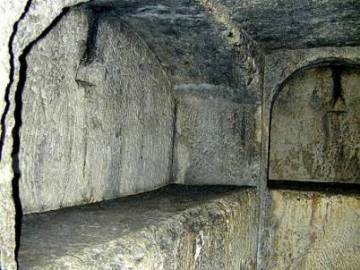 There is stress on the fact that Jesus was buried in a ‘new’ tomb – why? 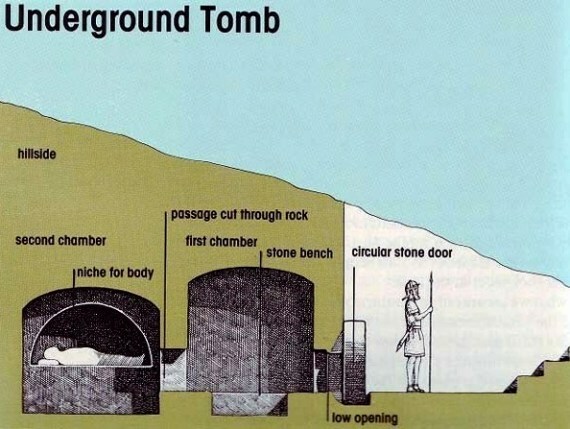 If Jesus’ body was the only body in a new tomb, this would rule out the possibility of several dead bodies being confused. Keep in mind that the gospel writers were telling their story after the Resurrection, when there were plenty of doubters to question the veracity of Jesus’ death and Resurrection. Matthew’s gospel (27:62-66) mentions an additional measure to prevent the theft of Jesus’ body: the posting of a guard at the tomb and the sealing of the tomb. Admittedly this was done on the Saturday morning, but the guard would certainly have checked the tomb first to see if Jesus’ body was there. What was the tomb like? It was hewn out of solid rock; there was no possibility of a rear entrance, or a secret one, through which the body might be stolen. Some of the women who watched Jesus die now waited to see what would happen to his body. If no-one claimed it, it would be buried with other criminals in a common grave. showed there were Galilean disciples who knew, and could testify to, the exact tomb in which Jesus’ body was placed. Their courage and devotion made it unlikely they would go to the wrong tomb when they returned on Easter morning. This knowledge was crucial after the Resurrection when people suggested that Jesus was not really dead or that there had been a mix-up in the place where he was buried. Moreover, the women had to know the location of the tomb if they were to visit it on Easter morning. 57 When it was evening, there came a rich man from Arimathea, named Joseph, who also was a disciple of Jesus. 58 He went to Pilate and asked for the body of Jesus. Then Pilate ordered it to be given to him. 59 And Joseph took the body, and wrapped it in a clean linen shroud, 60 and laid it in his own new tomb, which he had hewn in the rock; and he rolled a great stone to the door of the tomb, and departed. 62 Next day, that is, after the day of Preparation, the chief priests and the Pharisees gathered before Pilate 63 and said, “Sir, we remember how that impostor said, while he was still alive, ‘After three days I will rise again.’ 64 Therefore order the sepulchre to be made secure until the third day, lest his disciples go and steal him away, and tell the people, ‘He has risen from the dead,’ and the last fraud will be worse than the first.” 65 Pilate said to them, “You have a guard of soldiers; go, make it as secure as you can.” 66 So they went and made the sepulchre secure by sealing the stone and setting a guard. 42 And when evening had come, since it was the day of Preparation, that is, the day before the Sabbath, 43 Joseph of Arimathea, a respected member of the council, who was also himself looking for the kingdom of God, gathered his courage and went to Pilate, and asked for the body of Jesus. 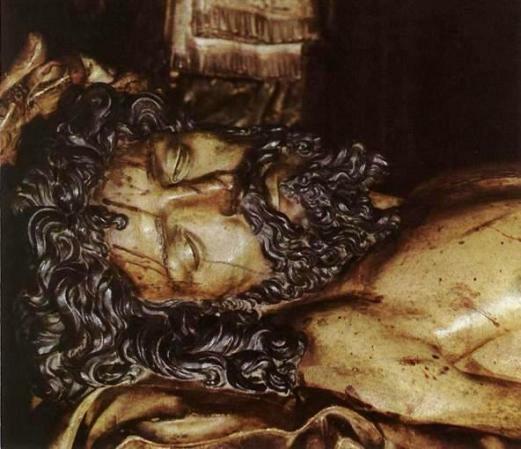 44 And Pilate wondered if he were already dead; and summoning the centurion, he asked him whether he was already dead. 45 And when he learned from the centurion that he was dead, he granted the body to Joseph. 50 Now there was a man named Joseph from the Jewish town of Arimathea. He was a member of the council, a good and righteous man, 51 who had not consented to their purpose and deed, and he was looking for the kingdom of God. 52 This man went to Pilate and asked for the body of Jesus. 53 Then he took it down and wrapped it in a linen shroud, and laid him in a rock-hewn tomb, where no one had ever yet been laid. 54 It was the day of Preparation, and the Sabbath was beginning. 55 The women who had come with him from Galilee followed, and saw the tomb, and how his body was laid; 56 then they returned, and prepared spices and ointments. On the Sabbath they rested according to the commandment. 38 After this Joseph of Arimathea, who was a disciple of Jesus, but secretly, for fear of the Jews, asked Pilate that he might take away the body of Jesus, and Pilate gave him leave. So he came and took away his body. 39 Nicodemus also, who had at first come to him by night, came bringing a mixture of myrrh and aloes, about a hundred pounds’ weight. 40 They took the body of Jesus, and bound it in linen cloths with the spices, as is the burial custom of the Jews. 41 Now in the place where he was crucified there was a garden, and in the garden a new tomb where no one had ever been laid. 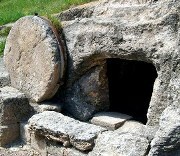 42 So because of the Jewish day of Preparation, as the tomb was close at hand, they laid Jesus there.